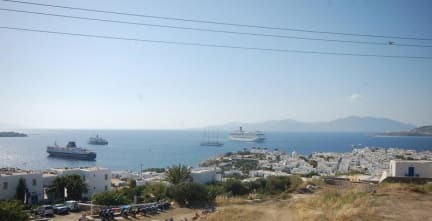 Morfoulas Studios are located 100m from the center of Mykonos Town, up on a hill overlooking the Aegean Sea. For those who prefer to stay close to Mykonos vibe, Morfoulas studios is the best choice for them. Being really close to the heart of Mykonos island, Morfoulas Studios offer both relaxed and vivid holiday experience to their guests. These apartments were build following the traditional Cycladic architecture style and one of their many advantages is the incredible view of Mykonos town and the port of the island (most of the studios have this view). Morfoulas Studios (standard) are equipped with Flat TV, Air-condition, Safety Deposit Box, Refrigerator, Kettle, Fully equipped kitchen, Hairdryer, Free toiletries, balcony, veranda or patio. Morfoulas Rooms (basic) are equipped with Flat TV, Air-condition, Safety Deposit Box, Refrigerator, Kettle, Hairdryer, Free toiletries, balcony or veranda. Morfoulas Rooms (Twin Ensuite) are equipped with Flat TV, Air-condition, Safety Deposit Box, Refrigerator, Kettle, Hairdryer, Free toiletries, backyard. A shuttle service to / from port and airport is available with an extra charge. The accommodation is on an uphill area and there is no pedestrian street. Morfulous studios was a fantastic place to stay at. It was conveniently close to all the shops and restaurants (walking distance). It offered a great view of the sunset from the terrace. The workers there are all extremely friendly and accomodating. Overall I had a wonderful exoerience here and would highly reccomend to anyone who is looking for a nice place to stay in Mykonos for an affordable price. Absolutely loved our stay at Morfoula's. The staff were extremely welcoming and the complementary airport shuttle service was so helpful. The location of Morfoula's is perfect for those wanting to be near Mykonos Town, but also Fabrika bus station to be able to visit the other areas of Mykonos. We'll be returning for sure! This is our 2nd year at Morfoulas. The location is perfect for town. Just a 2 minute walk to the bus station at Fabrika where you can get bus to all the beaches. It's very clean and comfortable and we always have a great nights sleep. The view out to sea and the windmills is amazing and stunning sunsets from there. We are already planning for next year. We are a group of Mum's and daughter's this place is perfect for everybody. Lovely private hotel to stay at. The staff was exceptional, shuttling us to and from the Port free of charge (which is basically unheard of). Extremely welcoming and accommodating. The room was clean and tidy, with all your essential needs. Close to the centre, only a 3 to 5min walk down/uphill. The only awkward part was the shower, as it was very small and let alot of water out onto the floor. I would recommend these accommodations to anyone traveling to Mykonos, just because of the price! The staff was very friendly. They were kind enough to pick us up from the airport. We had a lovely room and bath that was very clean. It was conveniently located next to the old town and a car rental place with parking. We got a car to tour the whole island ourselves which was great and really enjoyed the west and south facing beaches. Would recommend this hostel to most others, except party people should stay somewhere on the south side of the island. Mrs. Morfoulas' place lives up to all her reviews! It is family owned and feels that way when you arrive. Mykonos unfortunately only has one hostel but this lovely gem makes up for it. From the moment we arrived Mrs. Morfoulas was at the entrance to greet us. She gave us a map and drew out all the places to go to on it for us. The room was clean with a stunning view. At the end she gave us an adorable souvenir to take home with us. Her son has a car they use for port/airport shuttle service! Awesome location, comfy clean rooms and really lovely family business. We were picked up from the ferry terminal and even had delicious home-made cake left in our room for us one day. Perfect! Great location, super clean, free pick-up. They were very responsive to messages/queries. Room was cleaned everyday and Mrs. Morfoula even had cake for us on our last night. The terrace had a good view of the sea. Bus station and chora was a few minutes walk. This was a great find. Even though our ferry was delayed and we had no way to communicate the delay, the owner still waited to pick us up from the port. Good location, short walk to the windmills.